Dhaulagiri (8,167 m.) is the 8th highest peak in the world and it is most difficult and challenging trek in western part of Nepal. It starts with journey from Kathmandu to Myagdi via Pokhara. From Myagdi, the trek begins along the Myangi khola to Darnbang village. During this trek you have to pass French Pass (5,360 m.) and Thapa Pass (5,200 m.) which are both very difficult passes in Nepal. This region is very popular for rhododendron and magnolia forests and rolling terrace fields and beautiful village. In Nepal you can see more than 34 different type of rhododendron. You can experience ethnic Magar culture with Magar population predominating this geography. Amazing panoramic mountain view of Dhaulagri Range (8,167 m.), Annapurna Range (8,091 m.) and Nilgiri Range (7,061 m.) can be watched on this route. This trek is quiet adventurous. Flora and fauna and wildlife. Day 03 Drive to Beni (850m) 8 hrs. Day 04 Trek to Babiachor (950m) - 5 hrs. 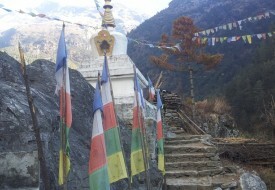 Day 06 Trek to Muri (1,850m) - 5 hrs. Day 20 Drive to international Airport and Departure.